Care should be taken to ensure that service and repair is carried out by a competent or qualified person. The rebuild kit is designed to overhaul your worn turbocharger. Great care should be taken when carrying out the rebuild procedure – it is important to determine the cause of turbo failure or premature wear. In either case, it is important to be certain to complete an oil and filter change – and to ensure that the turbo oil supply and drain lines are free from blockage or impendence. It is recommended that these lines are replaced, and the intercooler is cleaned before replacement of the turbo unit. Failure to do so may result in further damage to your turbocharger. Remove the turbocharger from the vehicle. Clean excess oil from the unit. Remove the circlip securing the actuator arm to the turbo core. Undo the bolts securing the inlet housing. Remove the bolt securing compressor wheel. It is left hand (reverse) thread. The core housing should be cleaned – check oil supply passages for carbon build-up or blockages. Carefully fit new bearings into the core. Fit oil seals to the shaft. NOTE: - DO NOT OVERTIGHTEN THE SHAFT. A TORQUE SETTING OF AROUND 8-10NM IS SUFFICIENT. Replacement of these parts is the opposite of removal. Use the diagram as a source of reference. 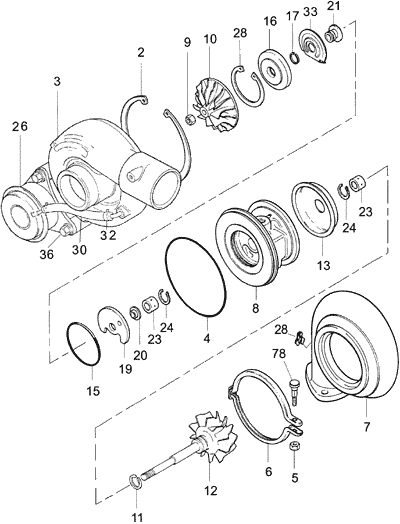 Be sure to CAREFULLY replace the split rings (both impeller and compressor end) as this provides an oil seal. All parts should be inspected for signs of damage or wear. If found, the replacement is necessary. Correct replacement of these parts should result in many thousands of miles of trouble-free motoring.